Michael McConville has said his family is angry at the decision not to charge Gerry Adams and six other people over his mother's murder. 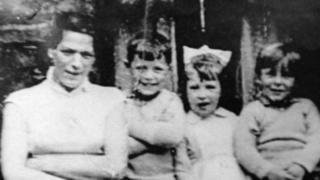 Jean McConville, 37, a widowed mother of 10, was abducted from her west Belfast home by the IRA in 1972, shot and secretly buried. Sinn Féin leader Mr Adams was arrested over her murder in May of last year. On Tuesday, the Public Prosecution Service announced that Mr Adams and six others would not be charged. "I was very disappointed when I heard yesterday," Michael McConville said. "We expected it in the case of Gerry Adams not getting charged, but the rest of the people, we thought somebody might have, so it was a big disappointment." He said other members of his family were "fuming" and "disgusted" by the decision. Mrs McConville was one of the Disappeared. Nobody has ever been charged with her murder. Her son said he knew four of those who dragged her away from her family home in Divis Flats in west Belfast as they were not wearing masks and lived in the area. "I see them now and again, not too often, but in some occasions I do run into them," Mr McConville said. "One of them used to drive a black taxi on the Falls Road. I had to get into a taxi one day and it was his taxi - I'm getting out and handing this man money for taking a fare down the road. "It's very hurtful knowing these people are still walking about the street." He said he would still be scared to reveal the names, not for his own life, but for the lives of members of his family. Mr Adams was released after four days of questioning about the murder and said there had been "a sustained, malicious, untruthful campaign" alleging that he had been involved in the killing. Veteran republican Ivor Bell, 78, has been charged with aiding and abetting Mrs McConville's murder.